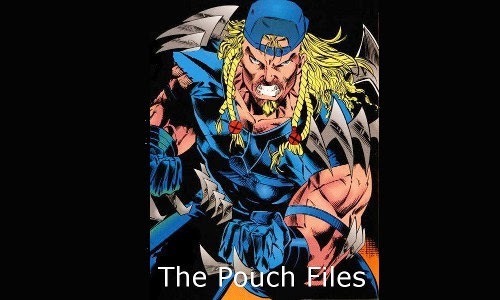 A comic book blog dedicated to celebrating and mocking the excesses of the 1990's. Thor is one of those ongoing series ideas that I never really understood. A perfectly acceptable supporting character in the Avengers, he's kind of limited by being a pretty hugely boring character who speaks in a strange accent. 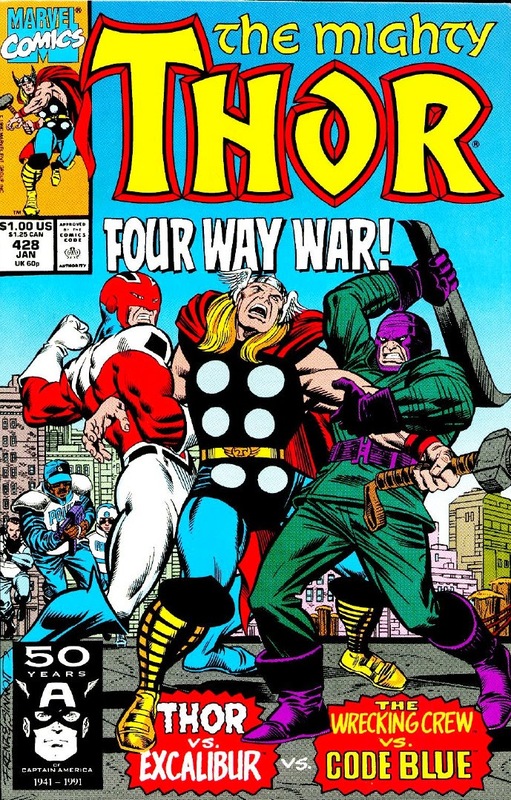 He's had an on-going series on-and-off for nearly fifty years, and outside of Walt Simonson's run, in which recognized Thor's blandness by focusing on a diverse supporting cast and less on Thor, the series has more or less been pretty forgettable for the majority of that time. That said, one of the better forgettable runs on the book probably belong to Tom DeFalco and Ron Frenz, formerly of Amazing Spider-Man. The duo are perhaps best-remembered for their all-time classic Spidey story "the kid who collects Spider-Man," a story that could've so easily turned treacly, but managed to avoid it just long enough to bring on the waterworks for most Spidey fans. After leaving that book, the team stayed together elsewhere, moving to Thor post-Simonson, where their attempt to get around the "Thor is boring" problem was to introduce a new, untrained character into the Thor mythos. DeFalco and Frenz would later collaborate on an issue of "What If?" that featured Peter Parker's daughter, Spider-Girl, who would go on to have a pretty successful hundred issue run through the late 90's and 2000's that was a throwback to early Spider-Man stories, but with a bizarre influx of DeFalco's 90's Spider-Man work. But enough preamble, let's get to the smiting! I wish a giant ice cream cone was in Juggernaut's hand. Thor 428 begins with a nice little variation on the artist trick, honed to a science in today's digital art medium, of drawing the same thing twice: first we see Juggernaut, trapped in the middle of a piece of concrete, apparently by the nearby Shadowcat, as we're told how Excalibur thought they were hunting down Juggernaut, a fugitive from British justice (is that really Excalibur's job, in New York City?). 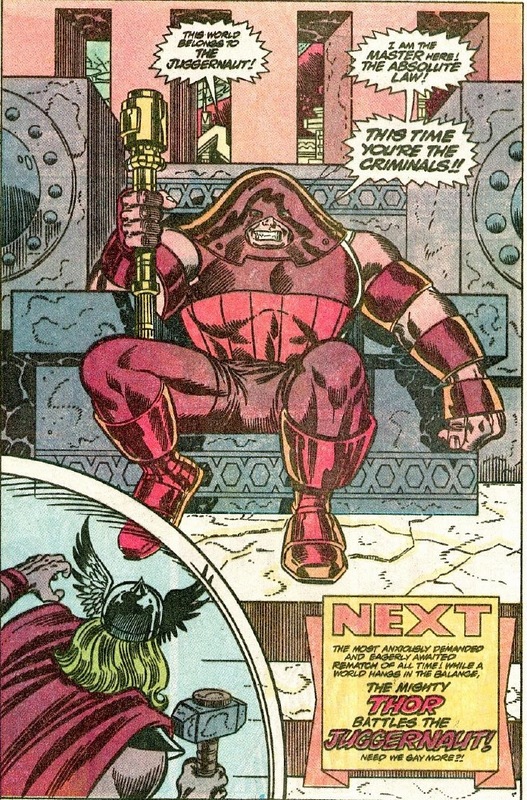 But then in the second panel, instead of the Juggernaut, we see it's really Thor that's been trapped. Oh no, Excalibur has been ensorcelled! We see that in addition to Excalibur, the battle has been joined by the Wrecking Crew, and Code: Blue, Marvel's answer to the Metropolis SCU that debuted a few years earlier in the Superman relaunch. Fortunately, Thunderball is a keen reader of the Appendix to the Handbook to the Marvel Universe, so he immediately recognizes the elite unit. Nearby, Ulik and the Enchantress gloat about tricking Excalibur, but the Enchantress reminds Ulik that they're invisible, not immune from observation. She then promptly fires a blast at the Wrecker, who is so stupid that he just assumes someone from Excalibur shot at him, and directs a blast of mystical energy at Captain Britain, who this story has apparently forgotten starts losing his strength when he's off British soil. 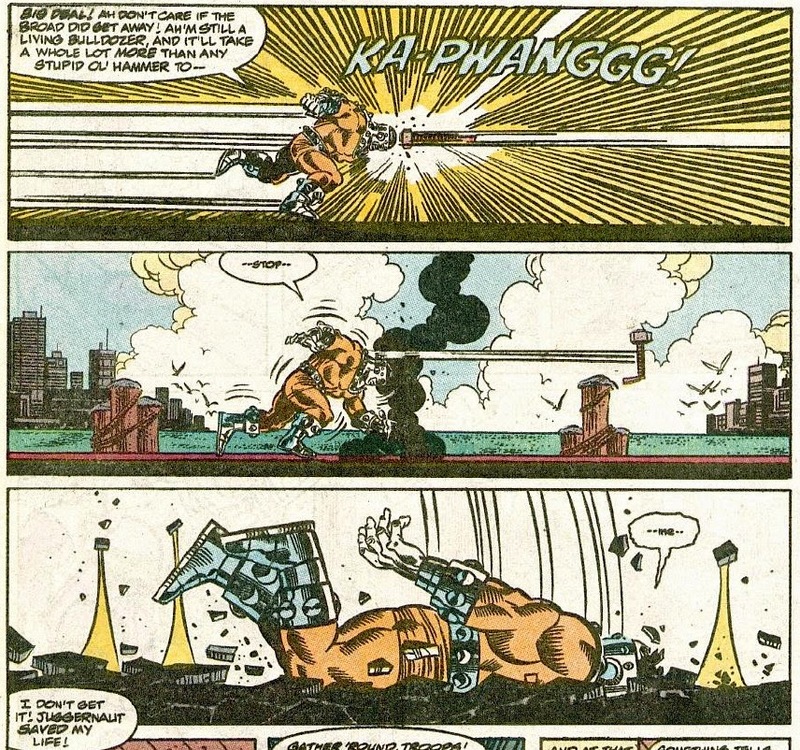 Unlike his friend, Piledriver hasn't heard of Nightcrawler, so he thinks knocking some boxes will KO the blue mutant, and is shocked when he disappears, only to punch him hard enough to send him flying. Kitty admires the "buns" of one of the Code: Blue cops, but then drags him through the dock and leaves him to drop into the water below, but, while bragging, he vaults himself to safety. Meanwhile, a very pained Thor swings his hammer around, creating some sort of magical vortex that blasts through the cement his body had merged with, freeing himself. Kitty recognizes that something's seriously wrong, but Phoenix says Juggernaut is "still vulnerable to a psychic attack," and then projectile fire shoots out of her hands(???). Thor responds with a blast from his hammer that further confuses Excalibur as Nightcrawler saves an unconscious Phoenix from a drop into the water. In the meantime, a very buff woman shoots Bulldozer with a "super taser," but Thunderball makes the save, destroying the taser with his ball and chain. A frustrated Enchantress and Ulik, on a nearby rooftop, are concerned that Wrecker continues to stand, so Enchantress magicks up some stones over his hands and feet, immobilizing him. Lockheed makes some deductive noises as he looks at the seemingly empty roof, and after Ulik stupidly says that the creature can detect them, gets dragon-fired for his stupidity. 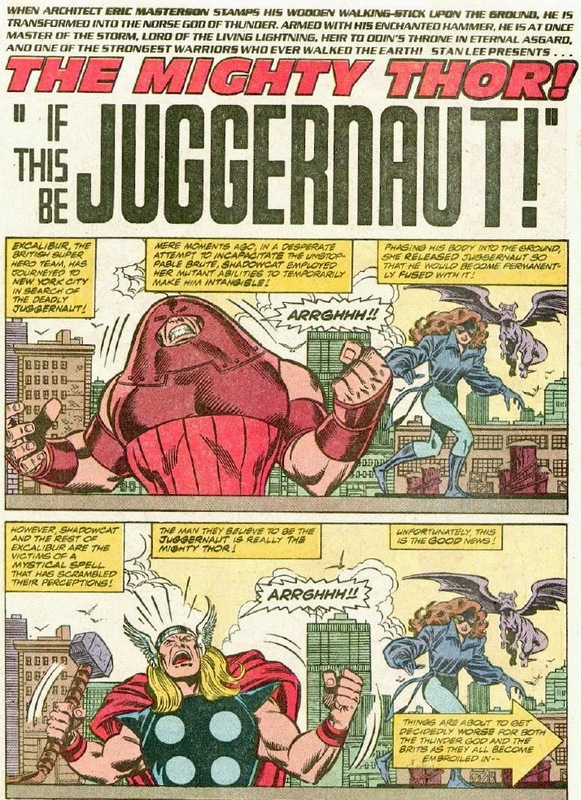 I can't help but hear Juggernaut's voice from the X-Men cartoon where he sounds like Pete from Mickey Mouse. While Thor and Captain Britain trade punches, Thor notices Bulldozer trying to sneak up on Shadowcat. He warns her, and tosses his hammer in her general direction. A confused Shadowcat phases underground, and Thor's hammer knocks Bulldozer out cold. Wrecker, seeing the tide turning, zaps away with his conscious friends. As he leaves, Excalibur finally realize that they've been dealing with Thor the whole time. 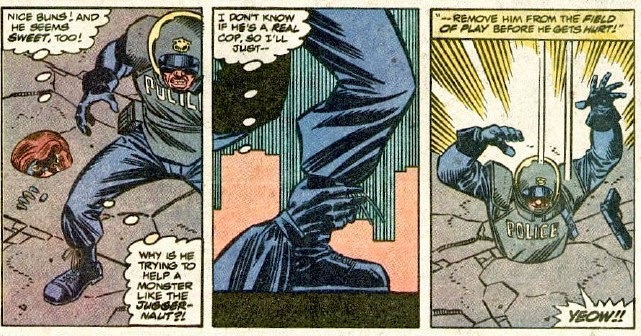 Bulldozer gets arrested by Code: Blue, and Thor talks about leaving Juggernaut on an asteroid the last time they met. He agrees to take the team there, but after appearing, the group get attacked by a mysterious group of aliens that lock the team and Thor into "unbreakable priso-spheres." The revived team is brought to a citadel, booed by the masses, as they meet the apparent king of this civilization: the Juggernaut! To be continued! I know Tom DeFalco's 2nd generation Stan Lee style isn't for everyone, but for me, this is the kind of stuff I grew up with, so I have to say I found this issue really fun, even if the character development was basically non-existent in order to plot a busy fight scene that lasts 17 pages. Frenz, known for his time on Spider-Man for his ability to mimic Ditko's style, here channels Kirby for some great splash pages (and the cover), and there's even a few shots of the Wrecker that I wouldn't be surprised if they were referenced directly from old Kirby works. But Kirby's work on Thor is some of his weakest (many blame Vince Colletta, an inker known for erasing and re-drawing entire backgrounds), so I'd actually put this ahead of most of Kirby's work on the book. Somehow the story opens and closes in equally dramatic cliffhangers without a feeling of "well, what was the point of that?" that sometimes accompanies "middle chapters" like this that are mostly fight scenes (for an example of how to do this poorly, read Secret Invasion issues 2 on). I still find Thor pretty dull as a character, but if this is any indication, I need to read more of Frenz's work on the book, because it's energetic and fun, simple storytelling. Almost none, as Thor rocks his classic outfit, Shadowcat wears her hideous 80's puffy shirt/tights outfit that makes her look like a henchwoman of a pirate-themed Batman villain, and most everybody else has pretty old-school designs. The lone concession is a member of Code: Blue who wears his hair out and down to his shoulders, covering it with a backwards baseball cap. I agree with your assessment of Thor. Growing up, I never "got" him. I've always felt the same way about the Hulk. They work fine as supporting characters or (in the Hulk's case) antagonists in other books, but on their own they don't much appeal to me. I do love Simonson's Thor and some of Peter David's Hulk, but that's about it. That said, I've always wanted to read the DeFalco/Frenz Thor. I've only seen bits and pieces, and, as with your experience here, I love the throwback Silver Age pastiche they did on the series, at least until Eric Masterson came along. I believe at that point they began to treat the title like any other then-modern series. "Unlike his friend, Piledriver hasn't heard of Nightcrawler..."
I'm pretty sure all of the Wrecking Crew would've encountered Nightcrawler during SECRET WARS. But maybe he didn't teleport in front of them or something...? Also, one correction: While Ron Frenz did draw "The Kid Who Collects Spider-Man", Tom DeFalco didn't write it -- Roger Stern did. And now I'll take this opportunity for some shameless self-promotion to note that my blog will be reviewing the story next month as part of my ongoing "Spider-Man by Roger Stern" series. You're right, of course. For some reason I lumped "The Kid Who Collects" with Frenz and DeFalco's run, which didn't occur until later. I'm a young professional who loves watching bad movies and reading old comics. And then talking about those things.